Today there was a social media campaign going on under the hashtag #fallbackintime. Readers and writers were talking about why they write or read historical romance, often with the sentiment that they love history or that they can read or write about castles and ballrooms. Personally, I love historical romance because, well, men with swords. The literal kind, I mean. But there’s another reason I love historical romance that doesn’t fit quite as well in the sound-biteable tweet. There’s an English playwright named Tom Stoppard who wrote a play called Arcadia. The storyline follows two parallel arcs, one in the present where an aristocratic English family is playing host to a couple of historians and the other follows the same family in the past. Among other things, it explores how well we in the present can truly understand the past given imperfect knowledge and our own biases. It’s quintessentially post-modern in its outlook, highlighting the absolute hash the present historians make of their interpretations of the primary source material left behind by the past. Their conceptions of what happened are colored by what they believe to have been possible or impossible and by prior scholarship on the historical figures they study. Their conclusions are largely wrong and when they’re right, it’s by accident or instinct more than scholarship. I read historical romance from all sorts of periods. And by periods, I don’t mean Georgian or Regency or Westerns or whatever. What I mean is that I’ve read historical romance from (arguably) Jane Austen through present day and what strikes me most about it is how different historical romance about the same periods changes as we change, as a society and as readers. One specific example is in the treatment of Christianity. Austen doesn’t seem to have thought much of many Anglican priests, but her characters go to church and interact regularly with men of the cloth socially and in church. Whether folks were whole-heartedly religious or not, avoiding the influence of the Anglican church would seem difficult. And yet I’d be pressed to come up with a Regency written these days that features any sort of cleric. I’m sure they exist, but in many current Regencies, church gets hardly a mention. Why? Well, because it isn’t important to us. Another example is the inclusion of more characters of color, of non-Christian faiths and queer characters in historical romance, something that I’d rarely if ever have seen even ten years ago. The past hasn’t changed. We have. And what we demand from our books has. 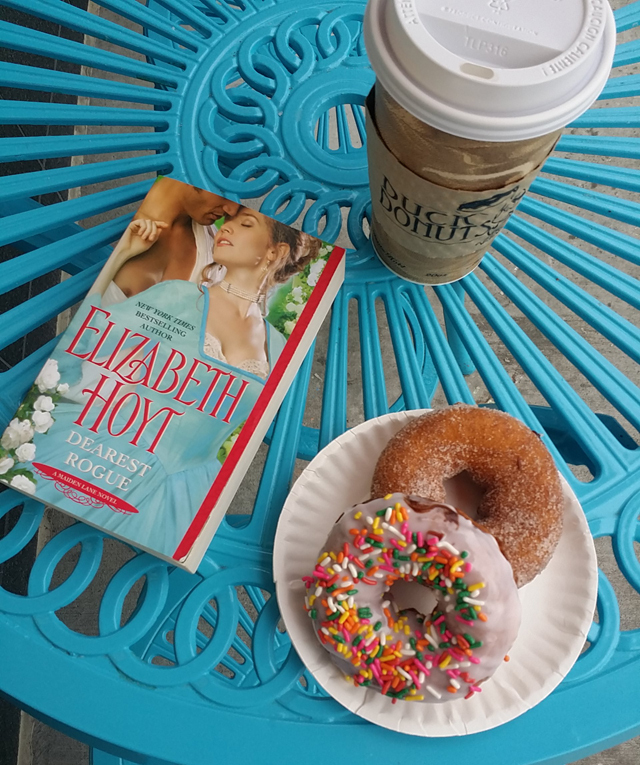 Today I was reading Dearest Rogue by Elizabeth Hoyt. Hoyt has always featured characters with physical and psychological challenges–difficulties that aren’t typically cleared up by the love of their one true soulmate–which is half the reason I love her. And in Dearest Rogue she does it again with a blind heroine and an injured hero with a permanent limp. But on the flipside, her characters are often almost superhuman in other ways. The middle of this series featured a character called the Ghost of St. Giles who might have been patterned off modern superheroes (Golden Age ones like Batman, Superman and Spiderman, not the current Avengers crop). Her historical romances are books of the distant past, the recent past and the present, all smushed together. This, in my mind, serves to illustrate another interesting facet of historical romance–that it shows us the past through the lens of our own experience. The things we’re fascinated by, whether it be the social rituals of Almack’s or the debaucheries of the gaming hell, even the insistence in some quarters on strict historical accuracy in language and food and dress, sometimes show us ourselves even more than the past. An admittance of bias doesn’t make historical romance any less true. And its most incandescent examples shine in any age.